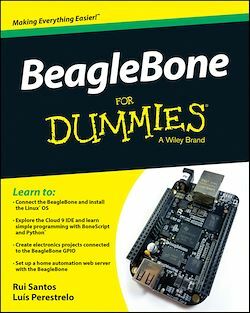 BeagleBone For Dummies is the definitive beginner's guide to using the popular BeagleBone board to learn electronics and programming. Unlike other books that require previous knowledge of electronics, Linux, and Python, this one assumes you know nothing at all, and guides you step-by-step throughout the process of getting acquainted with your BeagleBone Original or BeagleBone Black. You'll learn how to get set up, use the software, build the hardware, and code your projects, with plenty of examples to walk you through the process. You'll move carefully through your first BeagleBone project, then get ideas for branching out from there to create even better, more advanced programs. The BeagleBone is a tiny computer board – about the size of a credit card – that has all the capability of a desktop. Its affordability and ease of use has made it popular among hobbyists, hardware enthusiasts, and programmers alike, and it's time for you to join their ranks as you officially dive into the world of microcomputers. This book removes the guesswork from using the popular BeagleBone board and shows you how to get up and running in no time. To learn BeagleBone, you could spend hours on the Internet and still never find the information you need, or you can get everything you need here. This book appeals to all new and inexperienced hobbyists, tinkerers, electronics gurus, hackers, budding programmers, engineers, and hardware geeks who want to learn how to get the most out of their powerful BeagleBone.